The artists who responded to our survey were self-identified. This method of locating and questioning artists was modeled after an identification method used in an Urban Institute study of support structures for artists in the U.S.15 We recruited for the artists survey through several general population surveys throughout 2003. Respondents to our general population surveys were asked if they “study, practice, or do” any of the following activities: drawing or painting, creative writing, music, acting, dancing, filmmaking, or any other type of artistic activity. The six general categories included in this question were identified as the most popular artistic activities in the U.S., both in the 2002 Urban Institute study and throughout the 2003 Pew Internet Project Tracking surveys that were used to recruit self-identified artists for the callback sample. This list of activities is less extensive than the eleven occupational categories included in the decennial U.S. Census and the U.S. Bureau of Labor Statistics’ Current Population Survey.16 The broader list of eleven arts occupation categories has been used by the National Endowment for the Arts (NEA) to analyze artist employment in the U.S., but it does not represent an official NEA definition of artists per se.17 For the purposes of our telephone survey, we prompted respondents with an abbreviated version of this list, while being careful to not exclude artists from other artistic occupations. In every instance of recruiting in a general population survey and in the final callback survey, the respondents were given the option to choose an “other” category and specify the type of artistic activity they engage in. Those who indicated that they engaged in at least one artistic activity were then asked, “Thinking of all the kinds of artistic activities I just mentioned, do you consider yourself an artist?” All respondents who participated in our callback survey replied “yes” to this question when it was asked in a general population survey. Additional questions about employment, the amount of time devoted to artistic activities and the percentage of annual income that is attributable to being an artist were used to learn more about the artists’ reliance on creative work. The random sample that was gathered for the callback survey is a national sample of self-identified artists in the U.S. While this self-identification method does not yield a sample that is representative of all artists in the U.S., it was gathered without the influence or selection bias that is sometimes associated with population identification through artist membership organizations.18 Accordingly, our sample includes both professional and amateur artists from many different artistic disciplines. Paid Artists are musicians, writers or filmmakers who earn at least some income from their art. This section of the report includes findings from the total artist sample, as well as focused analysis on a subgroup of working artists referred to as “Paid Artists.” Paid Artists are musicians, writers or filmmakers who earn at least some income from their art. While all types of artists arguably have an important stake in the public debate over copyright and the internet, the subgroup of Paid Artists are on the front lines because of the ease with which their works can be circulated online and the visible involvement of their respective industries in lobbying and other legal battles. For these reasons, we have separately analyzed the responses of 215 Paid Artists in our sample when there are notable comparisons to be made with the total sample. Additionally, we often refer to the 184 “Paid Online Artists” in our sample. 57% of Americans study, practice, or do some type of artistic activity. Our November-December 2003 general population survey of 2,013 people showed that more than half of all American adults say they engage in some type of artistic activity. Projecting the results onto the entire U.S. population, this finding means that roughly 114 million Americans play musical instruments, sing, do creative writing, draw, paint, dance, act, make films and engage themselves in many other forms of artistic pursuit. About 28% of this creative group–32 million people–consider themselves artists.19 Some 32% of those who say they are artists (about 10 million people) say they get some form of compensation from their artistic endeavors. The 809 self-identified artists who were included in our callback sample come from a wide range of artistic disciplines and backgrounds. Most of these artists are involved in more than one creative field, though music, drawing, painting, and creative writing are the most common pursuits. The final sample of 809 respondents was weighted to match the demographic characteristics of the entire artistic population (more than 3,000 people) from the original general population surveys we conducted through 2003. Similar to the gender parity that exists within the general adult population in the U.S., male and female artists make up equal portions of the artist sample. However, unlike the general population, the artist sample is much younger. Fully 32% of artists are aged 18-29, compared to roughly 19% of the general population. Likewise, artists are more likely than the general public to have attended college. However, they are also more likely to fall into the lowest income bracket – those living in households earning less than $30,000 annually. This is likely a consequence of artists’ age — younger Americans tend to earn less money than older Americans. All of the Paid Artists in our sample earn some income from their art, and a fifth of them get 100% of their annual income from being an artist. The Paid Artists are more likely to be men than women. As a whole, they are younger than the general population, but older than the total artist sample. Half of Paid Artists are aged 30-49 and 27% are aged 18-29. Their racial and ethnic composition closely resembles that of the general public, though they are more likely to be white when compared to all artists. 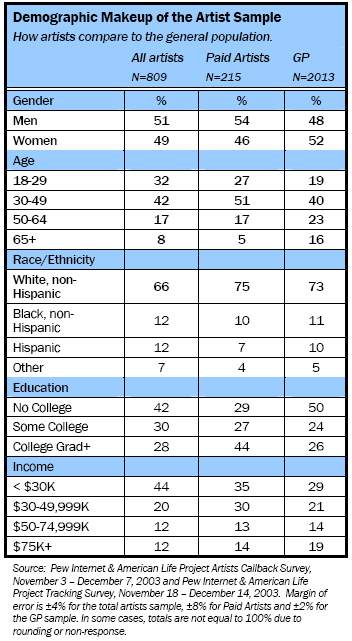 The most striking demographic characteristic of the Paid Artist sample is their education level; fully 44% of these artists have at least a college degree. Yet, despite this high level of education, the data suggests they may still earn somewhat less than the adult population at large. Artists are more likely than other Americans to use computers. The artists in our sample are experienced computer users relative to the general public. While just 72% of all American adults say they use a computer at their workplace, school, at home, or anywhere else, 84% of artists and 95% of Paid Artists use computers. Artists are also considerably more wired, particularly among older generations. Likewise, internet use has been woven into artists’ lives at greater levels than in the general population. While roughly two-thirds of all adults polled reported internet use in our regular November-December 2003 Tracking Survey of the general public, 77% of all artists polled and 83% of Paid Artists reported use of the internet in our Artists Callback Survey. Among the total artists’ sample, men and women report internet access in equal numbers–a finding that is consistent with the general public. Another trend that mirrors what we have found among all Americans; the younger the artist, the more likely he or she is to go online. However, while the young adult segment of the general public and the young adult artist population are equally wired (83% of all American adults aged 18-29 use the internet compared to 85% of all artists aged 18-29), the relative predominance of the internet in artists’ lives is evidenced among those aged 30 and older. For example, 73% of American adults aged 30-49 go online compared to 80% of artists who are aged 30-49; 59% of all Americans aged 50-64 go online compared to 73% of all artists aged 50-64; and 26% of all Americans aged 65 and older go online compared to 38% of artists who are 65 and up. Internet access does not vary as greatly according to income for artists as it does for the general public. When compared to the total population of internet users, Paid Online Artists also appear to have adopted the internet somewhat earlier in their lives; 49% of all adult internet users had been online for six years or more in our regular Nov-Dec 2003 Tracking Survey, compared to 58% of Paid Online Artists who participated in our Nov-Dec 2003 Artists Callback Survey. Artists use the internet as a creative workspace. One consequence of the intersection between creative content and the Web has been the newfound ease with which artists can search for and acquire the materials or personal connections they need to produce their work. This could mean purchasing painting supplies or equipment online; finding text, images or audio that provide inspiration for a film; educating oneself about creative techniques like using Flash video software to present an art installation online; or connecting with other musicians to work on a collective project. The internet, in short, can be a useful place to get answers to the practical day-to-day issues that arise when people are generating creative work and preparing it for display or distribution. A substantial segment, 42% of all online artists, says they order art supplies or equipment online. In comparison, 65% of Paid Online Artists say they order supplies or equipment online. Equal numbers use the internet to keep track of what other artists in their field are doing; 42% of all online artists say they follow other artists on the internet and 64% of Paid Online Artists say this. From asynchronous email conversations to real-time collaboration software, artists are using the internet to organize, pool resources, and carry out common goals. When asked if they ever use the internet or email to collaborate with other artists online, 33% of all online artists and 51% of Paid Online Artists who go online say they do so. And one out of every five artists we spoke to say they have posted creative content on a Web site. One out of every three Paid Online Artists says this. The internet has greatly improved connections between artists, art communities and audiences. The ease with which information and creative works can be circulated online has been cause for alarm for many artists and other copyright holders. However, paradoxically, the same insuppressible sea of digital information that permits widespread copyright infringement can also enable creators to communicate, collaborate, produce and promote their own work. The internet provides new opportunities to reduce the time and money they spend on production and promotion. It also can obviate the need for intermediary distribution support for some artists. As is the case with other professional and hobby-oriented communities, artists tend to thrive on the social and professional networks built around their art. Different artistic pursuits rely on varying types of offline opportunities to sustain these connections (workshops, performances, supply stores), but the internet can host common meeting places for even the most obscure or solitary types of artistic work. The online artists in our sample engage with internet-based community networking to a modest degree. One in six (17%) say they are a member of an email list-serve, online forum, or other online community or organization geared specifically towards artists. And one in four Paid Online Artists (26%) say this. However, when asked whether the internet had improved their connections with others in the art community, 23% of all online artists report a big effect in this regard, and 36% of Paid Online Artists report this level of improvement. Of the many potential internet impacts we queried, the internet’s role in improving connections to others within the art community was one of the most broadly observed effects. Artists are also recognizing the internet’s capacity to help broaden their fan base. Posting artist information and creative content online provides a way for audiences to discover and follow the work of artists from anywhere in the world. Additionally, the Web affords artists the opportunity to engage fans and followers of their work, despite their location or level of notoriety. In our artists sample, 23% of all online artists say they personally use the internet or email to keep in touch with fans of their art. Nearly twice as many Paid Online Artists (41%) say they communicate with their fans online. Of course, conveying information to one’s audience is not always a task that is carried out by the artists themselves. When asked more generally about the impact of online communication, 17% of all online artists say that the internet has had a big effect on improving their ability to communicate with their audience and fans of their art. About the same number, 15%, report a small effect and 64% report no effect. Among Paid Online Artists, 31% say the internet has had a big effect on improving their ability to engage with their audience, 24% report a small effect, and 44% report no effect. A more personal and somewhat more widely-used function of the internet is for keeping in touch with family and friends while touring or traveling for promotional events. Some 27% of all online artists use the internet for this purpose, while 51% of Paid Online Artists keep in touch with family and friends on the Net. However, a much smaller segment of all online artists, 12%, say they will use the internet to keep in touch with an agent or management staff. 27% of Paid Online Artists say this. Some artists use the internet to figure out what material is in the public domain. Few artists rely exclusively on the internet as their primary source of inspiration, but there are other practical online applications that can help to facilitate the creative process. For example, artists can use the internet to locate creative work from the public domain or to find out of if another artist’s work is legally available for them to use. This can be a crucial component to the production of an artistic work, as works in the public domain do not require the licensing fees and permissions typically associated with copyrighted works. Close to one-quarter, 24%, of all online artists say they use the internet or email to locate work from the public domain or otherwise investigate works they can use, and 37% of Paid Online Artists say this. Legally, while all original work has copyright protection once it is placed into a fixed form, it is much easier to enforce the protection of a creation if the copyright is registered with the U.S. Copyright Office. In an attempt to expedite the registration process, the Copyright Office has taken steps in recent years to create an online registration system that electronically accepts filings for literary texts, serials, and musical works and receives deposits in HTML, PDF, ASCII text, or MP3 format.21 A limited number of copyright holders have been authorized to submit applications through the CORDS system (Copyright Office Electronic Registration, Recordation, and Deposit System); however, the system is still under development and is currently unable to accept new applications until 2005. Although creators and rights holders cannot currently complete all steps of the registration process exclusively online, the U.S. Copyright Office Web site does provide all of the information and forms needed to register their works via mail. Other private companies offer “online registration” services that allow some types of creators to submit the required application materials electronically using a software program, after which time the company takes over the physical submission process and acts as a liaison for further communications with the Copyright Office. However, our research suggests that a fairly small segment of the artist population has been able to take advantage of any form of online registration; 6% of all online artists say they have registered the copyrights for their art online, and 10% of Paid Online Artists have done so. Many artists promote their work online. The internet provides a venue for artists to promote their work around the world at a small fraction of the cost artists typically incur with traditional marketing methods. For many artistic disciplines—whether it’s music, theatre, dance, or other arts—audiences are turning to the internet to find information about artistic events and products online.22 However, as artists and their agents become increasingly internet-savvy, it can be harder to differentiate an artist’s work from the growing roster of other artists with an online presence. Additionally, for some arts disciplines, the mass proliferation of unauthorized copies of digitized works on the internet can threaten the demand for authorized copies. These are new and significant challenges for those who are working to develop an effective promotional strategy that uses the internet. 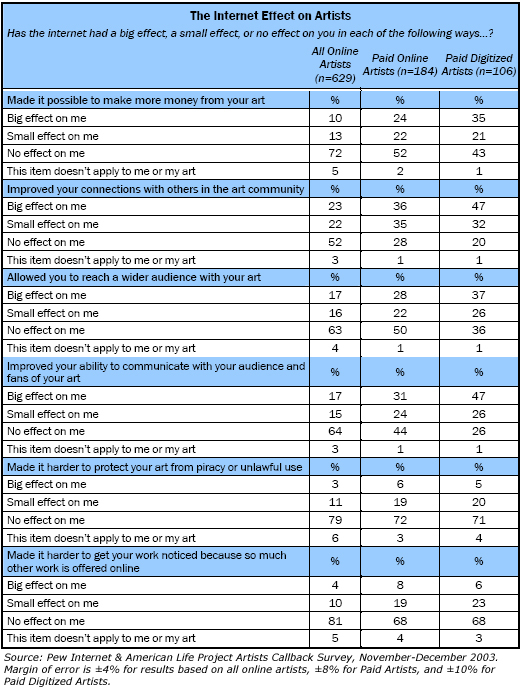 When we asked online artists if the internet had made it harder to get their art noticed because so much other work is offered online, 14% reported some effect (4% reported a big effect and 10% reported a small effect). And nearly twice as many Paid Online Artists, 27%, said it was harder to get their work noticed because of the competition they faced online (8% reported a big effect, while 19% reported a small effect). The Paid Online Artists in our sample are also twice as likely as those in the overall artist population to use the internet or email for various promotional purposes. Among Paid Online Artists, 45% report using the internet or email to promote, advertise or display their art. When looking at the larger pool of all online artists, 23% say they use the Web to promote their art in this manner. Finally, there is a group of artists that is best-positioned to utilize and benefit from the internet: those Paid Online Artists whose work has been digitized. There are 106 of them in our sample, and we call them Paid Digitized Artists. A dramatically larger portion of them, 61%, have used the internet or email for promotional purposes. Similarly, Paid Digitized Artists are also the most likely to say they have used the internet or email to provide free samples or previews of their art to the public. Just over half, 52%, say this. In comparison, 38% of all Paid Online Artists say they use the internet or email to help provide free samples or previews, while 20% of all online artists say this. When it comes to scheduling performances or other promotional events, 44% of Paid Online Artists say they use the internet or email to do this, and 21% of all online artists do so. However, for many artistic professions, artist management or other support staff might carry out these tasks in lieu of the artists themselves. The 16% of artists who have Web sites are the most likely to report that the internet has helped them reach a wider audience. In addition to understanding how artists employ the promotional applications of the internet, we also wanted to examine the perceived impact of these new capabilities. Not surprisingly, those who have reaped the most benefits in terms of audience reach are those who have been poised to do so. Some 63% of Paid Digitized Artists report that the internet has had some impact on their audience reach, with 37% saying the internet has had a big effect and 26% saying it has had a small effect. In comparison, 50% of Paid Online Artists say the internet has allowed them to reach a wider audience, with 28% reporting a big effect. And 33% of all online artists say the internet has helped in this way, with 17% saying it has had a big effect. The impact of the internet on audience reach is even more evident when we look within the segment of online artists who have their own Web site (either built by themselves or someone else). Some 75% of this group says the internet has helped them reach a wider audience, with 39% reporting a big effect. Still, while there are many repositories of artist information online, most of the artists we surveyed do not yet have their own Web site.23 Just 16% of online artists in our study say they have their own Web site, compared to 24% of Paid Online Artists. Surprisingly, the likelihood that an artist will have his or her own Web site does not vary according to age, except among the oldest of users (those aged 65 or over). But twice as many wired male artists report having their own Web site, compared to wired female artists. 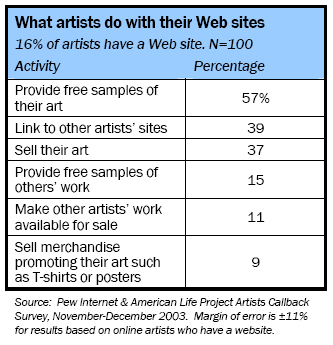 Looking at the larger sample of all online artists, 5% say they sell their art online at someplace other than their own Web site. This might include Web sites like Amazon.com, eBay.com or any number of art gallery Web sites, for example. In comparison, 14% of the Paid Online Artist segment reported selling their art online through someplace other than their own Web site. Nearly half of all Paid Online Artists and the majority of those whose work is digitized think the internet helps them create and distribute their work. Many artists feel that the internet plays an important role in facilitating the creation and distribution of their creative works. Their feelings about the internet vary according to how much time and money is invested in an artistic pursuit, as well as whether or not the artist’s work lends itself to digitization. Among our total artists sample, 13% of online artists say the internet is very important in helping them create and/or distribute their art, and 17% say it is somewhat important. Among Paid Online Artists, a much larger portion, 26%, of those who use the internet in a way that is related to their art, say the internet is very important for creation and distribution, while 19% say it is somewhat important. 22% say the internet is not too important in helping them to create and distribute their work, and 31% say it is not important at all. Paid Digitized Artists are the most likely to say the internet helps them create and distribute their work. Some 40% of Paid Digitized Artists say the internet is very important for these purposes, 18% say it is somewhat important, 23% say it is not too important, and 18% say it is not important at all. Few artists report negative experiences linked to the internet’s impact on their careers. The Paid Online Artists in our sample were overwhelmingly positive about the impact of the internet on their careers. In fact, 41% say the internet has helped their careers, and less than 1% of Paid Online Artists say that the internet has hurt their career. Paid Digitized Artists are more likely than others to say that the internet has helped them professionally: 54% say the internet has helped their career, and only 1% say it has hurt. Similarly, 56% of Paid Digitized Artists say that the internet has made it possible for them to earn more money from their art. More than one-third (35%) report a big effect, while one-fifth (21%) report a small effect. One in four Paid Online Artists say the internet has had a big effect on making it possible for them to make more money from their art, and 22% report a small effect in this regard. The following table summarizes artists’ judgments about the impact of the internet on their work and careers. Most of these artists have not personally experienced increased problems protecting their work because of the internet. When we asked artists whether the internet had made it harder to protect their art from piracy or unlawful use, most artists, regardless of their economic reliance on art, reported no effect. In all, 79% of online artists say the internet has no effect on making it harder for them to protect their art, while 14% report some effect (11% observed a small effect and 3% reported a big effect). Paid Online Artists were more likely to report some increased difficulty in protecting against piracy, though still only one in four reported this. Just 6% of Paid Online Artists said the internet had a big effect on making it harder to protect their art, and 19% said it had a small effect. Surprisingly, Paid Digitized Artists were no more likely than all Paid Online Artists to observe any negative effect. However, most say they would be bothered if someone else posted a digital copy of their work on the internet without their permission; One in five artists with digitized work say they have personally experienced someone posting unauthorized copies of their work online. 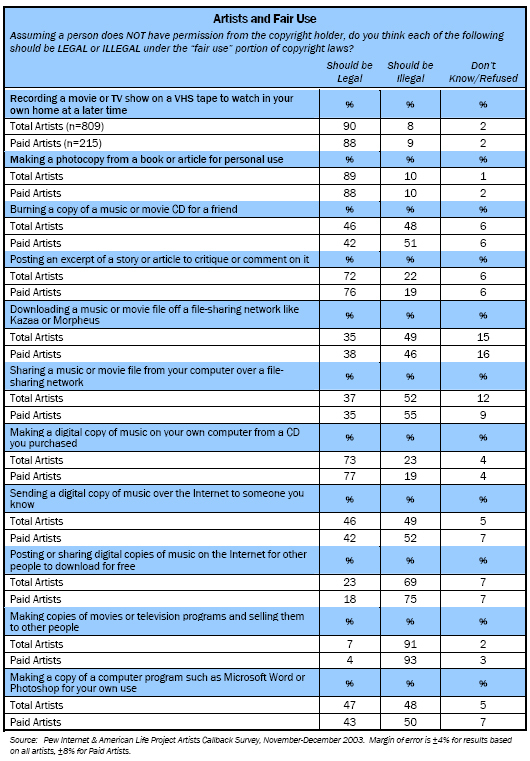 A majority of artists whose work can be digitized (a group that includes those whose work has not yet been digitized, as well as those who have digitized forms of their work), 57%, say they would indeed be bothered if they discovered that someone had placed a copy of their artwork online without prior consent. Among Paid Artists whose work can be digitized, roughly the same portion, 55%, said they would be bothered if others posted content of theirs without permission. One in five artists with digitized work say they have personally experienced someone posting unauthorized copies of their work online. There is no clear consensus among artists about the use of copy protection mechanisms that would block the unauthorized duplication of their work. A majority of artists whose work can be digitized (55%) said they would want their art to be copy-protected so that digital copies could not be made without their permission. Another 40% said they would not want their art to be copy-protected, and 5% said they didn’t know or refused to answer the question. The Paid Artists within that group were split down the middle on this issue; 48% of these working artists whose art can be digitized said they would want the copy protection, and 47% said they would not. Another 5% said they didn’t know or refused to answer. Clear majorities of all artists think that copyright owners should have complete control over the use of an artistic work. Once a piece of art is produced and copyrighted – whether it is a song, a painting, a quilt or a sculpture – 64% of all artists and 67% of Paid Artists think that the copyright owner should have complete control over the use of that work. A little under one-third of both groups think the copyright owner should have some control, and 5% say the owner should only have very little control. The rest say they don’t know or refused to answer the question. Artists’ sense of familiarity with current copyright laws varies according to their reliance on their work for the livelihood. But most claim not to know that much about “fair use” provisions. Not surprisingly, an artist’s self-assessment of his or her familiarity with copyright law varies according to profession and reliance on art. Some 54% of all artists in our sample say they are somewhat or very familiar with current copyright laws and regulations: 14% say they are very familiar, and 40% say they are somewhat familiar. Paid Artists are more likely to claim familiarity than others. In all, 76% of Paid Artists say they are familiar with the existing copyright regulations: 24% say they are very familiar, and 52% say they are somewhat familiar. Despite their general sense of familiarity with copyright law, most artists say they do not know much about the “fair use” portion of the law. The fair use doctrine, a deliberately vague and notoriously difficult body of law to interpret, allows some free use of copyrighted materials. In practice, fair use is given to those who want to make limited use of a copyrighted work (including such exceptional purposes as educational and journalistic uses, parody or critique, for example) without permission.25 When asked specifically about this body of copyright law, just one-quarter of all artists and one-third of Paid Artists say they are somewhat or very familiar with fair use (only 3% of all artists and 6% of Paid Artists say they are very familiar). Artists are very clear that most copying activities for personal use should pass the fair-use test. Nine out of ten artists agree that the practice of recording a movie or TV show on a VHS tape to watch at home at a later time should be deemed legal under the fair use provisions of copyright law. Similarly, nine out of ten artists think that making a photocopy from a book or article for personal use is also acceptable. There were no significant variations according to the earning status of the artists. About three-quarters of all artists and the subgroup of Paid Artists believe that it is permissible to post an excerpt of a story or article online in order to critique or comment on it. And roughly the same portion of both groups say that making a digital copy of music on a personal computer, otherwise known as “ripping,” from a purchased CD should be permissible. The one exception to this consensus that copying for personal use is acceptable comes in the area of software. Artists were divided in their opinions about copying a Microsoft program or Adobe Photoshop for personal use; 47% say such copying for personal use was fine, and 48% say it should be considered illegal. Paid Artists also lacked consensus over software copying. Artists are sharply divided about the legality of copying material in order to share it with others, especially when that is done online. When asked about burning a copy of a music or movie CD for a friend, artists’ views become sharply divided; nearly half think it should be legal, and another half say it should be illegal. Paid Artists are marginally more likely to consider CD burning to be a copyright-infringing behavior. Likewise, artists are split about the practice of sending a digital copy of music over the internet to someone they know; 46% think it should be legally acceptable behavior, while 49% say it should be illegal. Again, Paid Artists are marginally more likely to disapprove of this behavior. Half of all artists say that downloading music or movies on file-sharing networks should be illegal, and majorities think that posting free copies of music online should not be permitted. They firmly draw the line at copying and selling content without permission. Those who share files over the internet are seen as more legally culpable by artists than those who download files. Fully 69% of all artists and 75% of Paid Artists believe that those who post files are breaking the law. At the same time, 49% of all artists believe that downloading music or movie files over file-sharing networks should be considered illegal, and 35% say it should be legal. Sizable portions say they don’t know how to respond or decline to answer the question. Paid Artists generally echo these views. Copying for commercial or profit-driven purposes throws up a red flag for nearly all artists. Less than one in ten says it should be legal to make copies of movies or television programs to sell to other people, and fewer than one in twenty Paid Artists says this. A full table of artists’ responses about fair use, copying and sharing, appears below. Artists agree that current copyright laws do a good job of protecting artists’ rights, though few agree strongly. Half of all artists and half of Paid Artists say they agree that copyright laws are working successfully to protect artists’ rights. But just one in ten say they strongly agree. In comparison, just 24% of all artists and 30% of Paid Artists say they disagree with the statement that copyright laws do a good job of protecting artists’ rights, while less than 5% of both groups strongly disagree. A significant portion of all artists, 12%, say they don’t know or refuse to answer the question. And 5% of Paid Artists say they don’t know or refuse to answer. Most do not think that copyright laws unfairly limit public access to art. One-third of all artists and the same portion of Paid Artists say they agree that copyright regulations can place some unfair limitations on public access to art. Just 5% of all artists and 10% of Paid Artists say they strongly agree. But half of all artists and Paid Artists disagree with this statement. Less than 10% from each group strongly disagree. Another 13% of all artists and 8% of Paid Artists don’t know how to answer the question or refuse to answer. Just one in five thinks that the current length of copyright terms is too long. Under current law, the copyright for a creative work lasts for the length of the artist’s lifetime and then for an additional 70 years. Once a copyright expires, the work enters the public domain, and anyone can use it without requesting permission from the copyright holder. When we informed respondents of these terms, and asked about the current duration of copyright, three out of five say they think the length is just about right. Surprisingly, there were no significant differences between the responses of all artists and Paid Artists for this question. About one in five think that the length is too long, and 17% of both groups think it is too short. Less than 5% say they don’t know or decline to answer the question. Many feel that copyright laws do more to protect those who sell art than to protect the artists themselves. Half of all artists and half of Paid Artists agree that copyright regulations generally benefit purveyors of art work more than the original creators. Within the total artist population, 15% strongly agree that those who sell art are better protected by copyright laws. Within the subpopulation of Paid Artists, 19% strongly agree. Just 18% of each group disagree with this statement and 5% or less strongly disagree. Again, many respondents aren’t sure how to respond or refuse to; 15% of all artists decline to answer, and 8% of Paid Artists neither agree nor disagree. Overall, artists are divided, but not deeply concerned about the file-sharing that happens online. Just 14% of artists say they are very concerned about the issue of file-sharing on the Internet, and 28% say they are somewhat concerned. Another 31% say they are not too concerned, and 22% are not concerned at all. There were no significant differences between the responses expressed by the total artist pool and those expressed by Paid Artists. Similarly, responses from musicians within the artists’ sample resembled those of other artists: 17% say they are very concerned, 28% somewhat concerned, 32% not too concerned and 20% not at all concerned. The vast majority of artists believe file-sharing poses only a minor threat or no threat at all to creative industries like music and film. In all, 45% of artists say that file-sharing on the Internet poses a minor threat to creative industries like music and movies. In comparison, 28% consider file-sharing to be a major threat, and 22% say they think it poses no real threat at all. Again, the responses expressed by the total artist pool and those expressed by Paid Artists were nearly identical. Musicians within the artists sample are slightly more likely to say that file-sharing poses a serious threat, but a strong majority (69%) think file-sharing is a minor threat or no threat at all. The vast majority of artists think that file-sharing companies, not individuals, should be the ones held responsible for the infringement that happens online. When asked about the Recording Industry Association of America’s lawsuits against individuals who are accused of sharing large numbers of music files online without permission from the copyright holder, close to two-thirds of all artists felt that the companies who own and operate file-sharing networks would be a better target. Just 15% thought that the individuals who are sharing the music files should be the ones held responsible, and 15% thought both the individuals and the file-sharing companies should share the responsibility equally. Less than 5% thought that neither group or someone else altogether should be held responsible and less than 5% didn’t know how to respond or refused. Paid Artists and the musicians within the artists’ sample echo these views. They are split when weighing file-sharing’s impact on artists themselves. Nearly half of all artists (47%) agree with the statement that “file-sharing services are bad for artists because they allow people to copy or use an artist’s work without getting permission or compensating the artist.” However, another 43% agree that, “file-sharing services aren’t really bad for artists, since they help to promote and distribute an artist’s work to a broad audience.” Just 4% say they agree with both statements equally, 1% don’t agree with either statement, and 4% say they don’t know or refuse to answer. Responses from Paid Artists matched those of the total sample, and the differences between the musicians in the sample and all artists were within the margin of error. Like most internet users, online artists are also active consumers of media content online. But most who download files for free say they usually support the artist or author in other ways. However, for other media consumption activities, these artists generally resemble the average internet user. The percentage who say they download music files (22%) and those who download video files (13%) are comparable to the general public. Similarly, the portion that says they share files from their computer–such as music, video, pictures, or computer games–with others online (23%) is the same number that we registered from a recent sample of all internet users. Of those artists who download music files (n=118), most think that downloading has not really changed the total amount they spend on music purchases like CDs, concerts, or other music products (58% say this). Another 29% say they think downloading has actually increased what they spend on music purchases overall, and 13% say it has decreased their purchases. Likewise, among artists who either download music or video files (n=139), 86% say that when they download files for free, they usually end up supporting the artist or author in other ways, such as buying a CD or book or going to a performance. Just over half of all artists who download music or video files say they can’t always tell if it’s legal or illegal to download media files from the internet. More than two-thirds of the sample say they don’t currently pay to download any type of media files, but they would if the price, quality and choice they wanted became available.